There’s something about the perfect bathroom that eases tension and evokes a sense of relaxation. Help give your bathroom project the desired personality with our extensive variety of products including sinks, faucets, showers, tubs, vanities, and toilets. At ProSource® of Vero Beach, we are your go-to place for every bathroom remodel. There are only a few elements to a bathroom remodel, so it’s important to make them all count. 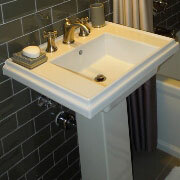 Start by choosing a bathroom sink that’s enjoyable. Choose from different styles, colors, and materials of sinks — don’t wash away style. Balance out any new sink with the perfect faucet. 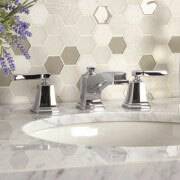 Choose from a cross, knob, or swing lever handle (just to name a few), the number of faucet handles, and finish. Create an alluring shower scape that will be loved. Choose from a single or double shower head, different shower styles, and shower doors that will help bring your remodel dream project into reality. Create a sleek and stylish bathroom look, all while condensing potential clutter. 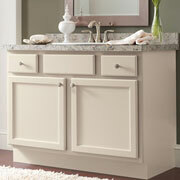 The proper bathroom vanity can hide bathroom necessities while providing optimal storage options. Young or old, everyone loves a good soak in the tub. 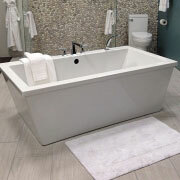 If the goal is to create a space where bathing is conducted by bath, choose from our sudsy selection of jacuzzi tubs or classic claw foot tubs, in various sizes, colors and materials. The less glamorous part of a bathroom remodel is choosing the toilet, but the throne must be chosen. 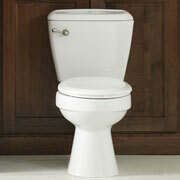 Swing by our Vero Beach showroom to discover the assortment of toilets we carry. Update to an automatic flush toilet or add some spice with a unique color.